The following is a listing of answers to questions commonly asked about this project and campaign. The listing will be updated as the project and campaign proceed. How will we handle the extra traffic on Religious Education nights in the neighborhood around the Church? We have established a committee in coordination with Shirley Norris for the explicit purpose of developing a traffic pattern plan that will be shared with the parents, teachers and students in the new building. We envision using additional volunteers for traffic control/patrol as least initially until the pattern becomes familiar. The approved building/parking configuration and alley traffic flow were designed purposely to manage the traffic from RE. It is our intention to follow through on what we promised and be good neighbors to those effected. Construction crews have been working on the parish center on the weekends. Isn't this costing us more money? No. The various trades gave us a price to do a particular part of the job and a purchase order was issued for each of those particular parts of the work. When the building erectors asked to work the weekends to take advantage of the weather in February and March, we responded "yes" as long as there were no extra charges. What are we going to do with our church property on McEvilly Road? The market value of the church property on McEvilly Road is worth less today than when we purchased it prior to the Great Recession. The church has paid in full for this property so there is no outstanding debt on it. The Diocese of Joliet is not inclined to have our church sell real estate at a loss. Eventually, when the property value increases and a sale does occur, those proceeds can be used for future needs of the parish. This property can serve as a “nest egg” for the parish. How come the project is now costing $5 million when the original estimate was $3.5 million? There was an original, preliminary, architectural estimate of $3.5 for a single story building of approximately 11,000 square feet and purchase of the property for the site across the street from the church. After reviewing these plans and receiving input from the parishioners, it was determined that more space would be required for immediate needs, as well as for future growth. The least expensive way to do this was to add a basement level. The cost for this additional level is approximately $1 million. This doubles the square footage, adding another 11,000 square feet for about 33% in incremental costs. The remaining additional $500,000 covers extra parking required by the Village, underground storm water detention, some increases from the original estimate once firm bids were received, technology upgrades (including security cameras, sound systems, Wi-Fi), additional property purchase and building bonds. That brings the total cost from the preliminary $3.5 million to $5 million and the need to raise $1.5 million. For what functions will the Parish Center be used? We anticipate the Parish Center will be used two days a week for RE classes. All other times (including evenings after RE classes) will be available for the other functions. ​How much money was collected under the original Seeds of Faith campaign? 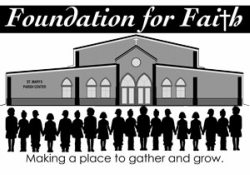 $2.072 million was collected under the original Seeds of Faith campaign. Has all of that money been allocated to the Parish Center? Out of the $2.072 million collected, $36,000 has been returned and $30,000 has been reallocated to other church projects at the request of the donors. How much money has been spent to date? What have the expenditures been for? This number will be changing on a regular basis—initial expenditures have been for purchasing the land and engineering fees associated with the development of the project. Approximately $600,000 has been spent. How much money will be required to complete the Parish Center? We will need to raise an additional $1.5 million to complete the planned Parish Center. What is the timeline for completion of the Parish Center? The goal is to have the Parish Center completed by September 2017, in time for the beginning of the fall religion education classes. How long will it take to pay for the Parish Center? The goal is to have the $1.5 million loan paid off within two years. Why didn’t we build the new church? Why are we building a Parish Center? The cost to develop the site for the new church ended up being much more expensive than originally planned. Building a new Parish Center is an excellent compromise. The Parish Center will provide office space for the religious staff, church committees and religious education. It will also provide us adequate space for us to celebrate larger Masses (Christmas, Easter, etc.) as a community. There will be an overflow room set up so that the masses that are capacity can be viewed from the Parish Center. By having the Parish Center across the street from the church will enable us to pull together as a community—have a place to go to for Donut Sunday, Knights of Columbus French Toast breakfasts, etc. Can I give my gift over time? Yes, the initial campaign will be over a two year period, but if you need additional time to make your contribution, we will be more than happy to work with you. Are there naming opportunities (classrooms, common area, stained glass, brick pavers, etc.)? What happened to the “Seeds of Faith” campaign? Will the “Seeds of Faith” campaign continue? The “Seeds of Faith” campaign is concluded. The moneys that were raised through that campaign will be used as the foundation for the development of the new Parish Center. We thank everyone who supported the "Seeds of Faith" campaign.